The 59-year-old representative of Iceland at the 2001 Venice Biennale, Finnbogi Pétursson is less well known than his younger compatriot Olafur Eliasson, but his light-and-sound installation “Infra-Supra 2019” suggests that Eliasson may have been deeply influenced by him. It begins quietly with the huge screens empty. 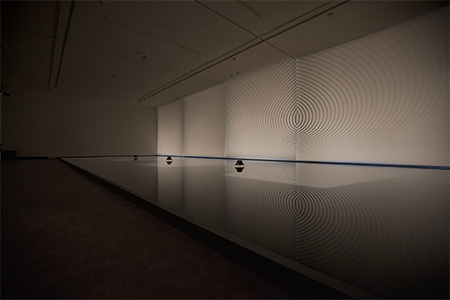 Sounds are generated by three speakers set over a rectangular, pool of water with black ink; the dark surface ignites as concentric circles produced by the speaker sounds are reflected on the screens above. With the room darkened, we experience the eerie links between the low-frequency sounds and the constantly shifting Op Art-like patterns. Pétursson is extending sculpture’s task by employing strategies that occupy space, trigger neurological activity, and suggest monumentality without weight or conventional materials. “Infra-Supra 2019” is not so much meditative, with its slowly shifting sounds and images, as it is unsettling, disturbing but ultimately delightful. Pétursson has presented his time-based art projects internationally. The current installation offers us a chance to experience this important development in international art: disembodied sculpture which substitutes sound, light and technology over mass, volume and weight. That it retains scale and monumentality is the point. In an adjacent gallery, a six-part photography piece, “Reset” (2016), is related to the installation indirectly. Wave patterns in another black-ink pool were photographed at various stages of movement and captured as they assumed irregular optical patterns.